I guess I asked for that one. Ya know...Ya just can't win around here. If I had a messy loading bench I'da caught hell. As it is it was clean and now gelandangan says I have an "empty mind". And just because the only CD player I have is in the pickup [for the moment] I have been told that I missed the elevator to the 21st century. Have you really listened to the finer smoothness and harmonics that records and tapes give music over the bland and harshness of CDs?? For all that...I'm not going to invite any of you to my "Hooray!! Football season is over with. Now I can have my TV programs back" party today...So there!! Thanks guys now ya got me on my high horse to get my basement kitchenette finished. Well it's not going to be a kitchenette anymore it's going to be my new reloading room. It's been almost done for about 5 years now but just never got around to finishing the last dozen doors and the rest of the trim. It will be pretty decent down there,hell there's a fridge for the beer right in the room. Now I just have to keep my son out of the beer! then give me a chance and I'll show you what a full brain looks like. I'll get around to cleaning it up one day. A clean bench would be good for that, I think. Joe...Is that your case trimmer on the front of the bench? Novel idea. Might work except for my "fumble fingers". I'd be pickin' a lot of cases off the floor. That is a neat idea for the case trimmer! Think I'll look into that. I've got mine fastened to a piece of 2x6 and C-clamp it to the bench when I use it. I guess I am going to have to get my new room done so I can post pictures of a clean bench too. 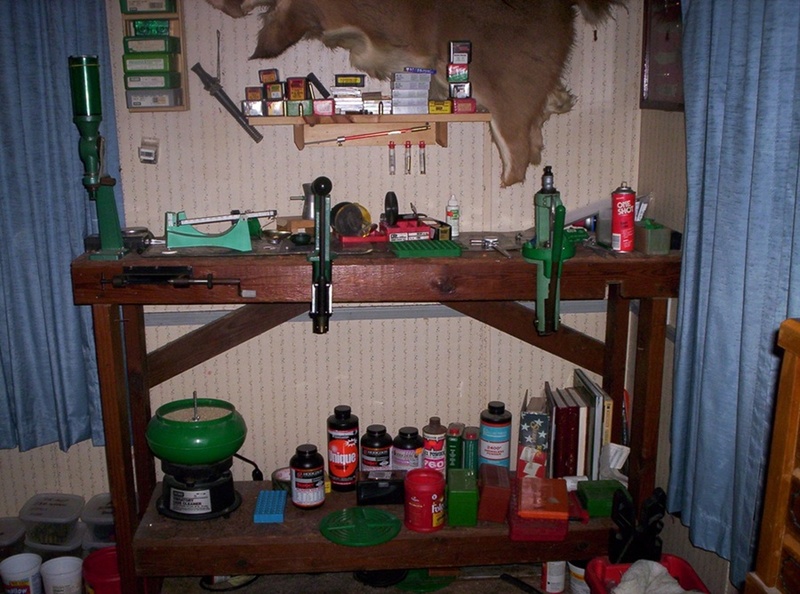 My reloading benches are made to sit down at - so I can spend more time there. I have the cabinets on the wall and some of the set-up done but I have one more set of shelves to build and hang before it is done. I have been busy with car repairs over the last month or so and I have a transmission to finish for a friend before I can work on the room.